One of our more elaborate styles, the CELESTE features finger-tab "fringe" along the bottom edge decorated with a galaxy of metal discs and studs. These may be all the same, or in patterns of silver, brass and copper -- different on every piece! 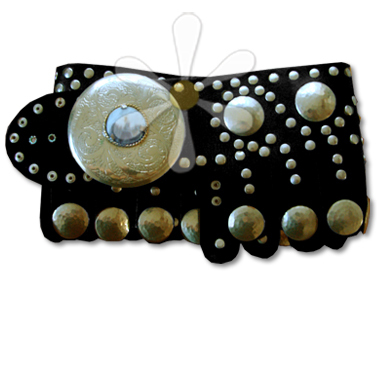 The disc buckle often has a natural agate stone cabochon, the pattern of which is also, as may be expected, unique to each belt.